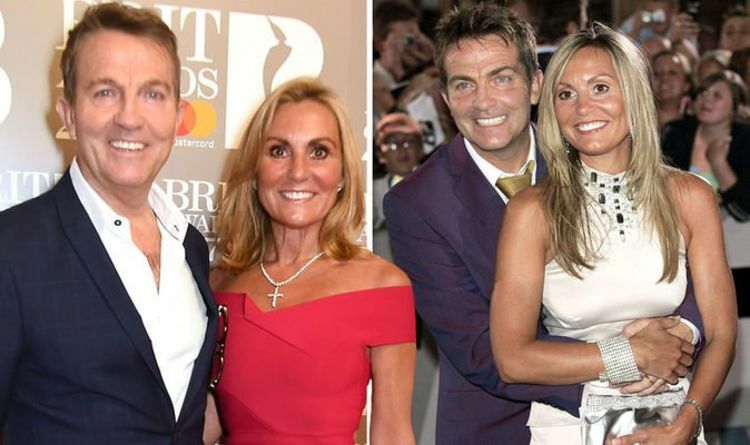 The Chase favourite Bradley Walsh, 58, has been married to blonde beauty Donna Derby for over 20 years. Donna previously caught the eye of fans in the 1988 video for Simply Irresistible, in which she joined a line-up of more dancers to perform some seriously steamy choreography. In some shots, dancers were seen gyrating behind rock singer Richard in a skintight pink and purple bodycon dresses which showcased their figures. Other shots showed members of the line-up in slinky black numbers thrusting and wiggling their hips. Donna previously recreated the Simply Irresistible video alongside Bradley’s pal Holly Willoughby, 38, in a clip which the This Morning presenter shared with her 5.3 million Instagram followers. The pair could be seen performing the dance moves in front of a screen which was playing the music video. The clip was filmed by Bradley, who turned the camera around to show himself grinning as Holly and his wife burst into giggles at the end. Donna’s dance past also included appearances in The Russ Abbot Show in 1987, where she played a dancer. She featured in several instalments of The Kenny Everett Television Show between 1987 and 1988. More recently, she has worked as a choreographer for the Miss World pageant. Bradley and Donna are parents to son Barney Walsh, 22, with whom The Chase star recently embarked on a road trip for ITV, Barney Walsh & Son: Breaking Dad. The show saw the father and son duo travel around the US tackling nerve-wracking and intense challenges including jumping out of a plane and experiencing 5G as they tried out astronaut training. The series also showed them bonding and caused fans to fall head-over-heels in love with Bradley’s son Barney as much as they are with him. Bradley has hosted The Chase since the ITV quiz show first began in 2009. To date, he has presented over 350 episodes of the beloved afternoon game show. The father-of-two, who has daughter Hayley from a previous relationship, is also an actor and made a name for himself in Coronation Street in the mid 2000s. Last year, he made his Doctor Who debut as one of the 13th Doctor Jodie Whittaker’s new companions, Graham O’Brien. Tonight, The Chase Celebrity Special will see Bradley joined by Patrick Baladi, 47, Vicky Williamson, 25, John Craven, 78, and Kevin Eldon, 59. The four famous faces will go up against the Chaser in a bid to win cash for their chosen charities. The Chase Celebrity Special airs today at 5pm on ITV.